This is a rose that is distinguished by name and by nature. It was named after Lady Banks, the wife of Sir Joseph Banks the first Director of the Royal Botanical Garden at Kew and an eminent botanist and explorer who accompanied Captain Cook on his voyages to the South Seas. 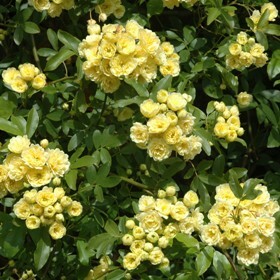 He chose a great rose for his wife – the evergreen West Chinese Rosa banksiae. It does however like a sheltered warm site and is a very large plant – two drawbacks that mean it is not often seen in Britain and rarely seen in small gardens. Our specimen is of the double pale yellow form. It can also be found with single white and single yellow flowers. The south facing wall of the Alpine Yard feels like the Mediterranean on a warm day and so the plant is in an ideal spot to make flower buds and put on a stunning, if brief, display.